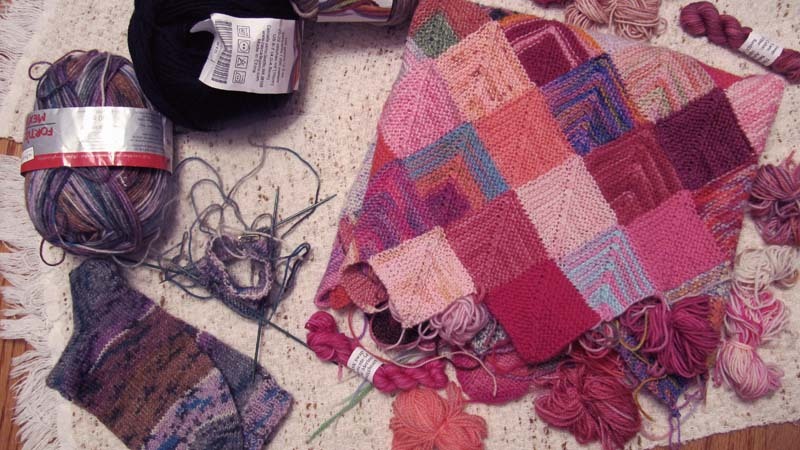 On Saturday I'm heading out for a week of knitting, classes, sightseeing and eating in Santa Fe and Taos, New Mexico with a group organized by Jane Thornley. I must take a deep breath and think logically about packing. I'm not worried about clothes: a couple of pairs of jeans, one good pair of slacks, t-shirts, comfortable shoes, toiletries, hair stuff, etc. - the basics. 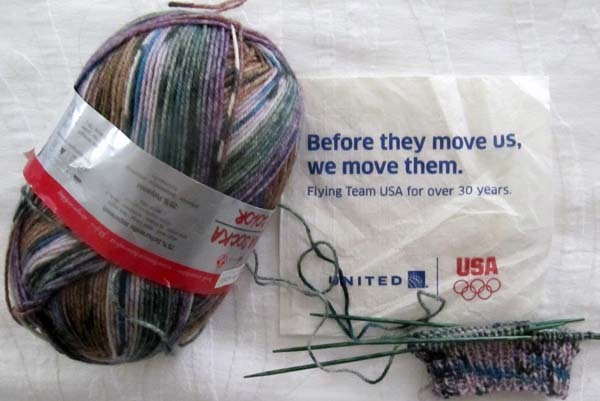 The knitting, on the other hand, takes more planning. On the right is "Floyd", the name that's been given to my pink afghan by my always humorous friend, Pam A. Floyd. Pink. Pink Floyd. Get it?!! Pam cracks me up. I've got around 175 more little blocks to make and I've been cutting 8-yard lengths from balls of yarn and winding them into little butterflies for the trip. I actually have *4 afghans* in the works at the moment and I'd really like to complete something before I afghan again! More about them later in this post. To the left is the scond Maryland sock. The first was finished almost a month ago and I'm only now working on the cuff of sock #2. With so much sock yarn in the stash I need to keep going. Besides, I do have that goal of finishing 12 pairs of socks in 12 months. I'm on track to succeed so I can't slow down now. Nine pairs are finished and I know that knitting time is sometimes limited towards the end of the year. Above that is the yarn to make another Airborne cap. You may remember that I was making hats for my friend's grandson, Tyler, and his friends, who were in Afghanistan. Now, Tyler's brother, Brent, has just finished his Airborne training and needs a cap, too. He's still in the US, by the way. I think that's enough knitting. I hope so. I also have to be sure that I have the needles, patterns and supplies that I'll need. My brain hurts from all this planning! Besides the knitting, I'm taking along my new school textbook. My first class is on September 10th and I thought I'd get a head start on the reading. Okay, the *4 afghans* that I mentioned: (1) Moderne Log Cabin from the ladies at Mason-Dixon Knitting. The link goes to the free pattern posted on Amazon.com - the one I'm doing is on the left. I started this back on July 18, 2008. It's time to wrap this one up. I have done all except the last 2 blocks, #9. I set it aside when I started thinking that it was big enough already and maybe I should do the border and call it done. I never really decided, or picked it up again. It is big enough and needs to be finished. (2) The Sock Yarn Blankie is so close to being finished that I'm actually able to use it in it's unfinished state. I'm now working the little triangle bits to make straight sides, then I'll do the border and it'll be done. (3) Floyd. This won't take long as I'm motivated to finish as soon as possible and it is coming on vacation with me. The plan is to finish these projects within the next month to six weeks. I'm getting itchy to get back to challenging intarsia, fairisle sweaters, and, especially, my Bohus and the Triangle Squares Cushion. (4) Lastly is my Travel Afghan. I'll need to take more trips before I'll have all the blocks completed so I'm not really in any hurry to finish this project. I am, however, a year behind. I currently have 3 blocks that need to be done and after next week that number grows to 4. Getting caught up is high on my list of priorities. Feel free to nag me, ask me how these projects are coming along and if any are finished! If you look on the sidebar you'll notice that I've added another countdown timer. (NOTE: It was taken down after the concert.) I put those there for myself more than anything else. Part of the fun of going on vacation or going to a concert is the anticipation. I like checking the timers and seeing the event growing closer and closer. The new countdown is for a concert. I managed to snag good seats at the upcoming show starring Buddy Guy and Jonny Lang. It's no secret that I love excellent guitar playing and I like the blues, so this concert scores on both counts. Buddy Guy is the kind of player that other musicians want to play with. 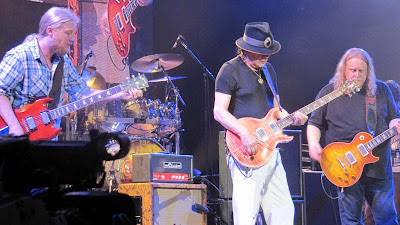 The Allman Brothers Concert that I went to in July was on the same day as Buddy Guy's 76th birthday and the band said Happy Birthday to him and then played "Wake Up Little School Girl" in his honor. Here's a clip I found on YouTube that's 15 years old and it sounds as good today as it did back then. Jonny Lang is only 31 now so you can appreciate how good he was when he was only 16, playing with long-established musicians. So now, I'll patiently (sort of) wait for one full month until the show, watching the time grow closer on the little counter. Enjoy the video clip. Most of these are rich, deep pinks with a few light ones mixed in. The 20 mini skeins are enough to complete about 40 of the 334 blocks I'll be doing. 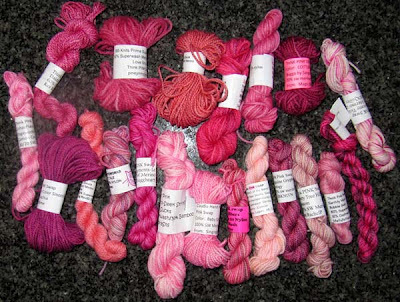 I did some stash diving and found out that I have some pink yarns, too. I've done a few more blocks since taking this picture last night and I've finished about just over one-third of the afghan. I'm planning to go through the stash again on the weekend to see if there are any more pinks hiding out. I love how this is turning out, so bright and cheery. Am I sick of doing all this little 3-inches blocks and weaving in the ends? Not at all. Already I'm thinking ahead to possibly doing one more, this time in southwest colors. I might even try to organize the blocks into a geometric pattern. All that will be in good time, however! Of course, I couldn't go on vacation without checking out a yarn store in the area. This time, I went to two of them. The first was All About Yarn in Columbia, MD. I walked in the door and was greeted by a friendly "hello" from the owner as well as the ladies who were sitting and knitting. The shop is packed with lots and lots of yarn from many of the major companies. I found a couple of skeins that needed to immigrate to Canada. I had difficulty, however, finding a yarn that would specifically remind me of this vacation and the area for my Travel Afghan. I like to choose something from a local dyer if I can. I picked up one ball of yarn that I hadn't seen before in variegated blues, for the blues I was going to be hearing at the concert. It's from a company called "smc select" and the yarn is Extra Soft Merino Color. It's very pretty, denim-y shades of blue and I might be tempted in the future to get enough yarn to make a shaker-stitch pullover to wear with jeans. That is, IF I ever get caught up on my gazillion other projects. There's even more to the shop than what you see in this picture. If you walk to the back on the right and then turn left there is another big room. On my last day, a Monday, I decided to visit Cloverhill Yarn Shop just a few miles up the road in Catonsville. I wanted to visit this particular shop and Monday was the only time I was going to be able to get there. Imagine my disappointment when I found out that it's closed on Mondays. 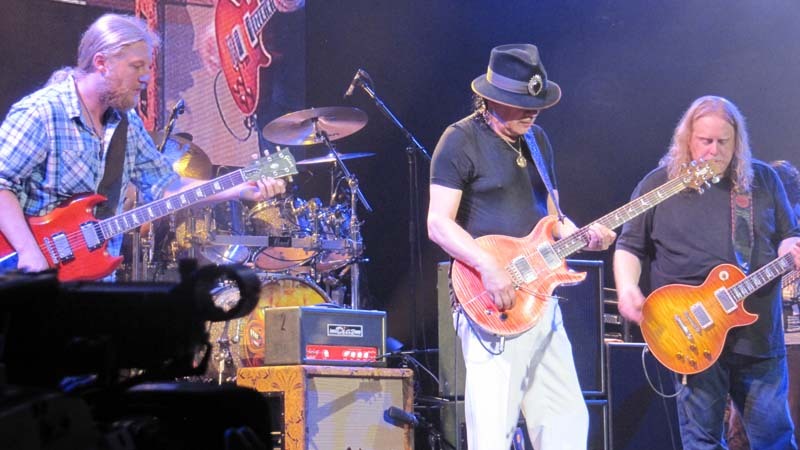 Just as a coincidence, I had been 'talking' with a lady on Ravelry about the Allman Brothers/Santana concert as she was going, too. Her name is Jolene. 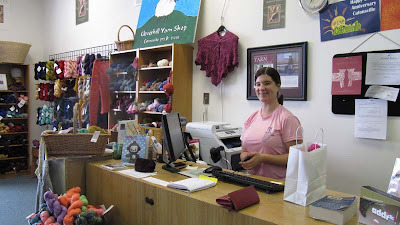 It turned out that she wasn't just another knitter but was a yarn store owner, too, and her shop is Cloverhill Yarns! I had hoped to meet her. I sent an email saying that I was sorry that I missed her on this trip and she wrote right back telling me that she was going to be in the shop and that I could drop by. How nice. I was very pleased to be able to see the store and to meet her afterall. Her shop is full of lots of great yarns and many were from local dyers - just what I was looking for. One of the dyers was Jolene herself. She didn't have any yarn on hand that was the right weight for my Travel Afghan but she's going to dye some for me and it'll be coming in the mail. Perfect. I really need to get caught up on my Travel Afghan as I'm a year behind. It think it'll be moving to the top of my must-do list this weekend. I want to get up-to-date before I head out to Santa Fe & Taos in September. If I'm ever back in this area (maybe for Maryland Sheep & Wool...hmmmm......) I'll definitely be visiting Jolene's shop again. 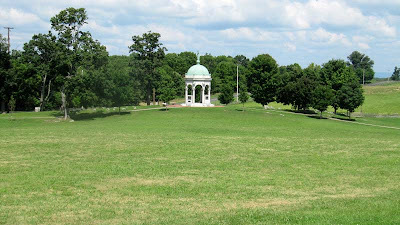 I'd also like to spend more time in Catonsville. It appears to be a music mecca in the area. I noticed that as soon I drove downtown.and saw the many music shops. So much world. So little time! The concert was on the last day of my trip, but on the first full day I decided to take a trip to the Antietam Battlefield from the Civil War in Sharpsburg, MD. It felt a bit odd to me to be driving through the countryside at ~60 mph, air conditioning on and Led Zeppelin playing on the radio, a bottle of water in the cup holder. My mind drifted to what it must have been like to be a soldier heading to battle on foot with little to eat or drink, shoes in poor repair if he had any at all and most likely frightened but not wanting to show fear. 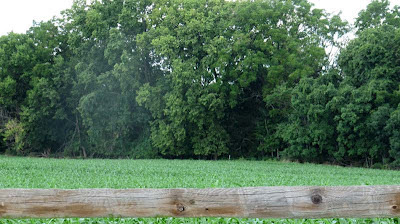 Fields and forests stretched out on either side of the tree-lined road. The trees were so large that I imagine that they were still there back in September of 1862. How many soldiers took cover or shelter behind those trees? Driving through the towns close to the site was like stepping back in time. I didn't see any large 'big box' stores or parking lots, no billboards advertising a chain of restaurants. The towns were small, the road getting narrower. 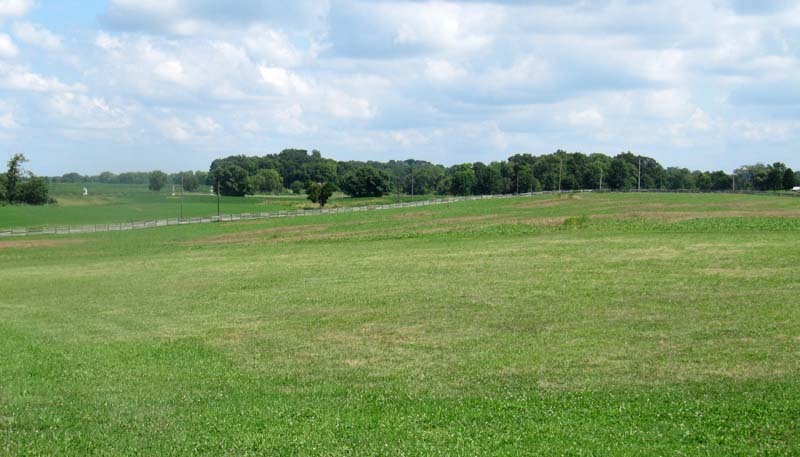 I stopped at the field, above, just outside of Sharpsburg to soak up the scenery, so quiet and peaceful now. Before long I saw the sign indicating that I was at the Battlefield. 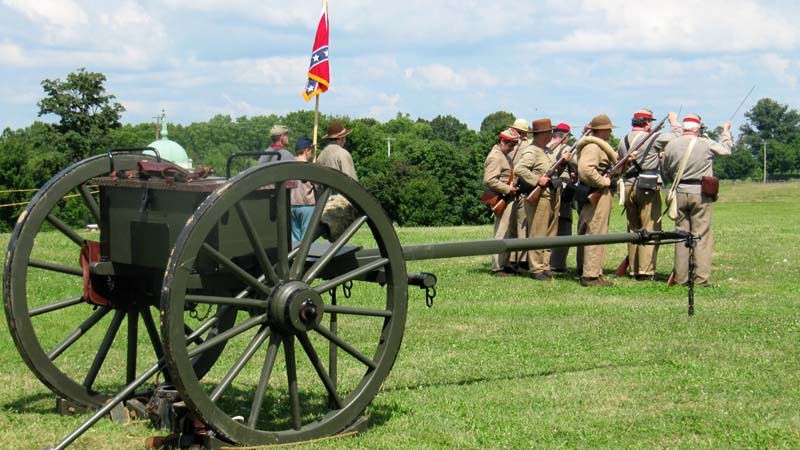 Later in the afternoon there were reenactors demonstrating part of the battle. These men represented the South. It was a very moving and humbling day. 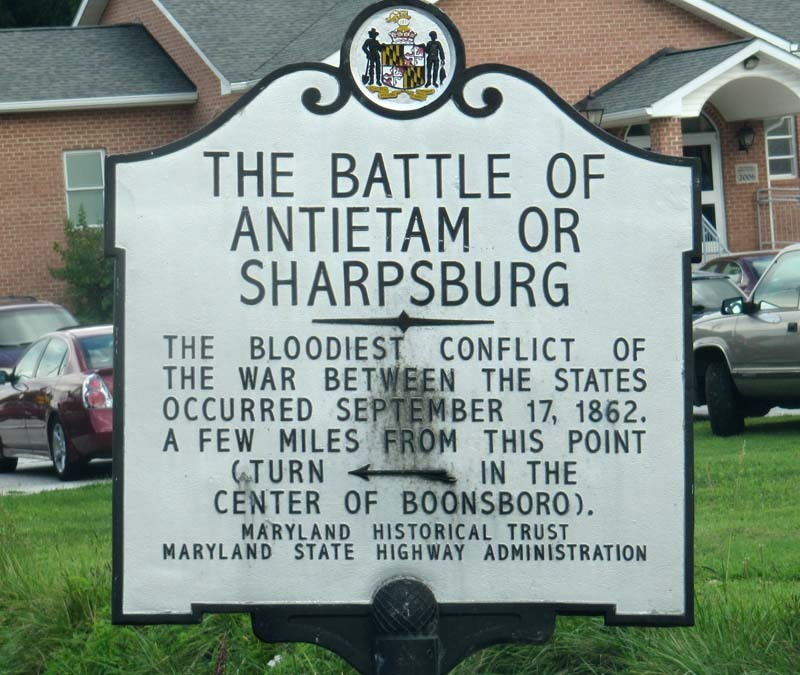 Before visiting Antietam I watched the Ken Burns' documentary, The Civil War. I very glad that I did as I learned a great deal, much more than what was taught in school. If you ever get a chance to see it (I borrowed the DVD from the library), I highly recommend it. 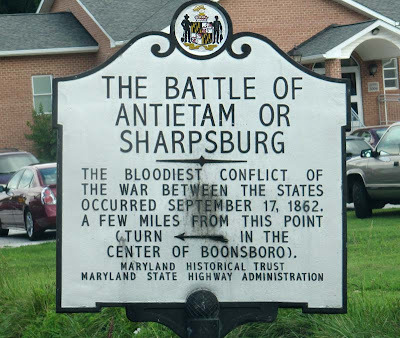 Then, if you visit places such as Antietam and Sharpsburg, you'll not only know what's going on, you'll feel to your very soul. For many years I had wished that there was a yarn crawl in the Denver area. 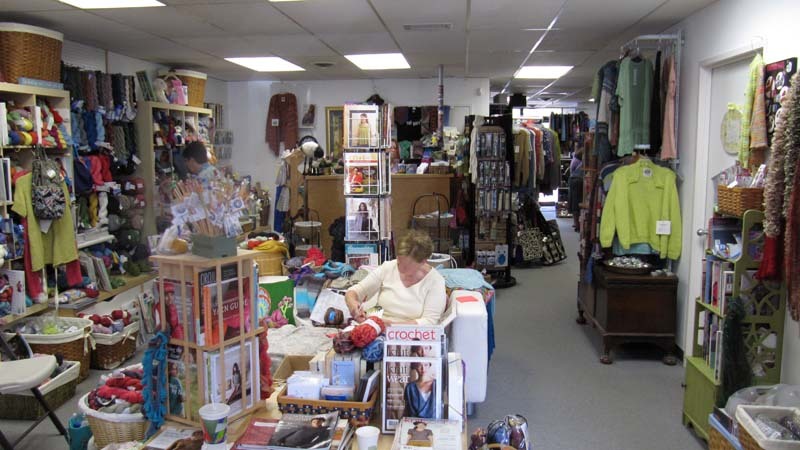 Denver is blessed with many shops and it would be fun to visit them all as an organized event. At the time I was working at A Knitted Peace in Littleton and I remember that a yarn crawl was a topic of conversation. However, that's all it ever was then...a topic of conversation. To my friends in the Denver area who will be checking out the shops, keep me posted and I hope to see you next year for the yarn crawl. And, shop people in Calgary, it could work here, too. Just sayin'. There is a saying that you can't teach an old dog new tricks. I hope that there is no truth to the saying as, in my case, I'm the old dog and going back to school is my new trick. I have just been accepted into the BA program with a concentration in photography at the Savannah College of Art and Design, also known as SCAD! They have an eLearning department and I can join into class discussions, get assignments and learn by way of my computer. Isn't technology wonderful (much of the time)? While I would love to be able to be in Savannah and take a full course load on the campus it's not possible to be in two places at the same time and the daily commute from Calgary would be a killer! This is going to be a multi-year undertaking on my part, taking one or two classes every semester. I'll be starting with the fall semester which starts on September 10th. I'm hoping to visit Savannah again next spring and I'm planning to take a tour of the campus and visit some of the professors. It's all very exciting and a little scary. It's been a long time since I was last in school on a regular basis. I'm hoping that it won't take too long to get back into the rhythm of studying and learning. Back on the 4th of July I started a new pair of socks in red, white and blue. The yarn was part of the Regia Circus collection, but this color looked more patriotic to me than anything. It seemed only right to finish them in July, too, and I wove in the last end on July 27th. 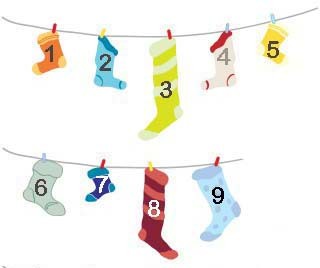 This is pair #9 in my quest to complete 12 pairs of socks in 2012. I'm pretty-much right on track, so far at least. It's hard to know what to say about Santana, either the band or the guitar player. Words like amazing, sensational or talented just don't begin to say enough. I've been lucky enough, now, to see them four times: 3 in the Denver area (Pepsi Center, Red Rocks and Fiddler's Green) and now during my trip to Maryland. When I heard about the concert and decided to go I thought that the Allman Brothers were to be the only act and that was good enough for me. Then, I found out that Santana was also going to be playing and I felt like I'd won the lottery. Every song they played was perfect and polished. The band is enthusiastic. It's nice to hear two wonderful bands that are all about the music and not about the flash, theatrics and costume changes. 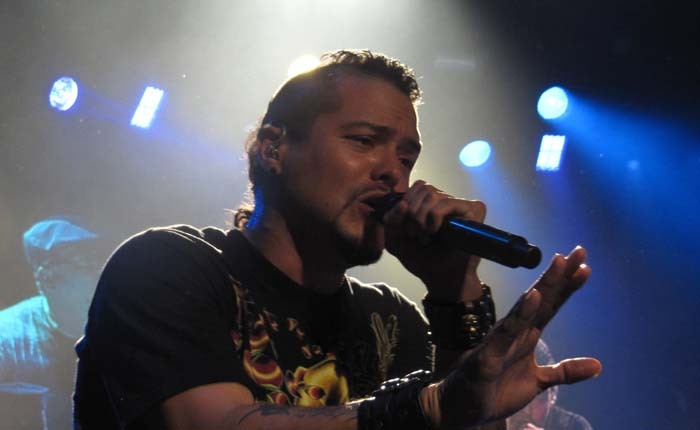 Singer, Andy Vargas (above), puts a lot of feelings and emotions into all of his vocals, as does Tony Lindsay. Tony made me laugh. At one point during the performance I had my hand under my chin. He came to where I was and mimicked my pose exactly. Too funny. Check out Carlos Santana's shoes. Not many men could pull off wearing all that pink. I guess that being on stage helps.﻿ The man was stylin'. Actually, I wouldn't mind having a pair like them myself! Near the end of the show Derek Trucks and Warren Haynes, guitarists from the Allman Brothers Band, came back on stage and played with Santana. For someone like me who loves good guitar playing, it doesn't get much better than this. The only thing that might have made it better would have been if David Gilmour from Pink Floyd had've joined them! The biggest highlight of the concert was hearing the Allmans do the song "Jessica". I was beginning to think I wasn't going to hear it and then they started playing it as their last song before they were called back for an encore (Whipping Post). It made my night. Second to that was hearing the Santana band playing "Smooth". The song has been around for a number of years but I never get tired of listening to it. The concert was on the last night of my trip and the main reason for it. 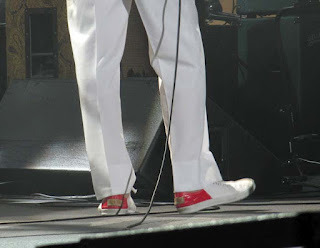 However, there was something else, something very different from the concert that I did. 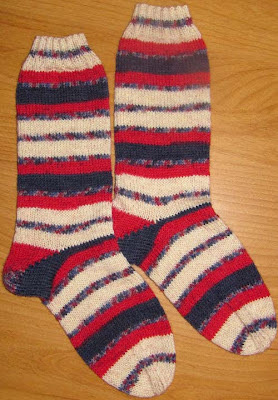 I'll post about that soon, but next up, I have a pair of socks finished (not the Maryland socks) that I need to record. I can't believe I only packed one knitting project for my trip to Maryland. I have a bad habit of packing twice as many projects as days that I'll be away. Okay, so I did pack extra needles just in case I picked up some yarn and had the uncontrollable urge to start knitting immediately. I was good this time around. 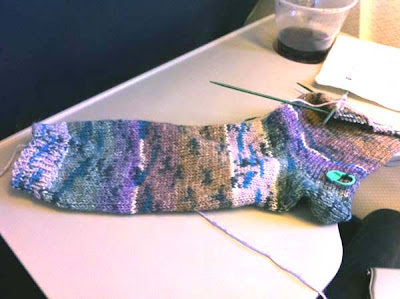 I cast on the stitches for a sock while I was waiting to board the plane in Calgary at the start of the trip and knit through the day on the plane, and between flights in Chicago. I knit a little in Maryland, but the trip was busy and time was short. However, I did finish the sock on the flight home - except for doing the Kitchener stitch to close the toe. I didn't bring a large-eye needle with me on the plane. The color is a little weird as it's not always easy to get decent lighting on a plane. I've only just started the second sock. Other projects at home, like the sock yarn blanket, are tempting me away. BUT, I will not give in to Second Sock Syndrome. These socks will be finished soon. 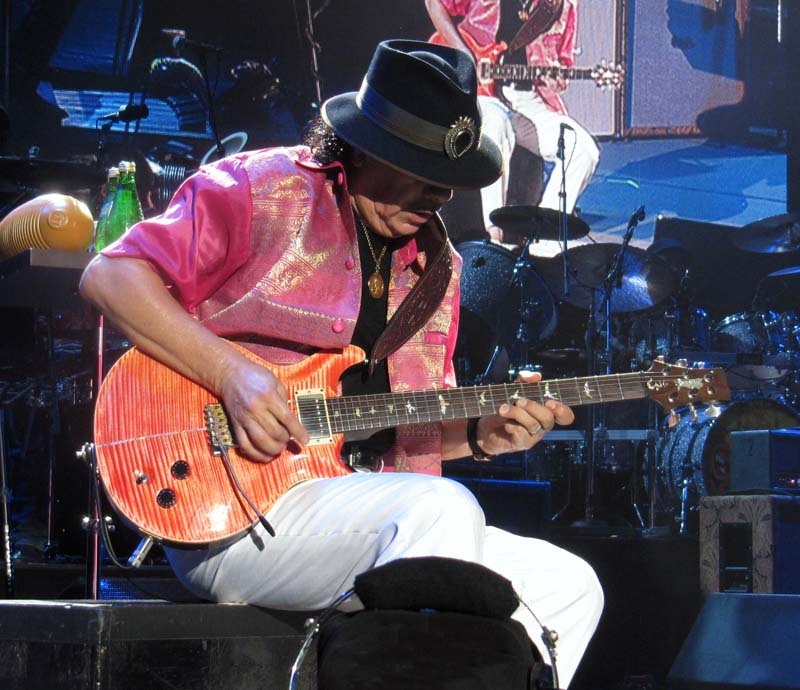 Next up, back to the concert - Santana! Do you remember being asked that question when you returned to school in the fall? I always hated it because, usually, all I did was hang out with friends and the teacher wanted more than one line in the essay. Later, when I became a teacher, I realized that it was an easy way for the teacher to start the first day, minimum preparation! So, here I am, writing about my summer but at least I have interesting things going on. Last weekend I flew to Maryland as there were two things that I wanted to see, plus the requisite stop at a yarn store. 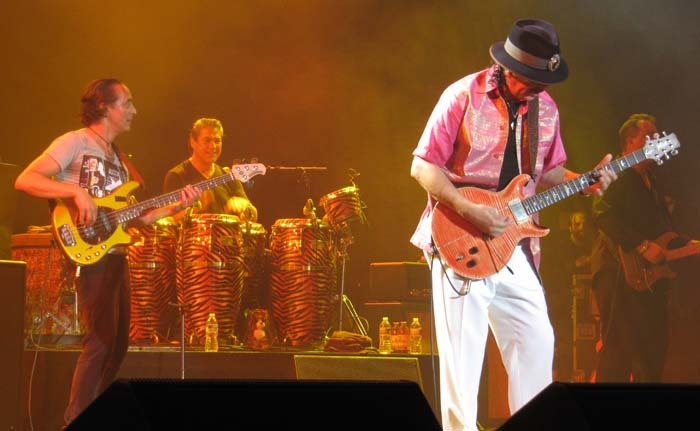 My main purpose to was to go to the Allman Brothers/Santana concert at the Merriweather Post Pavilion. 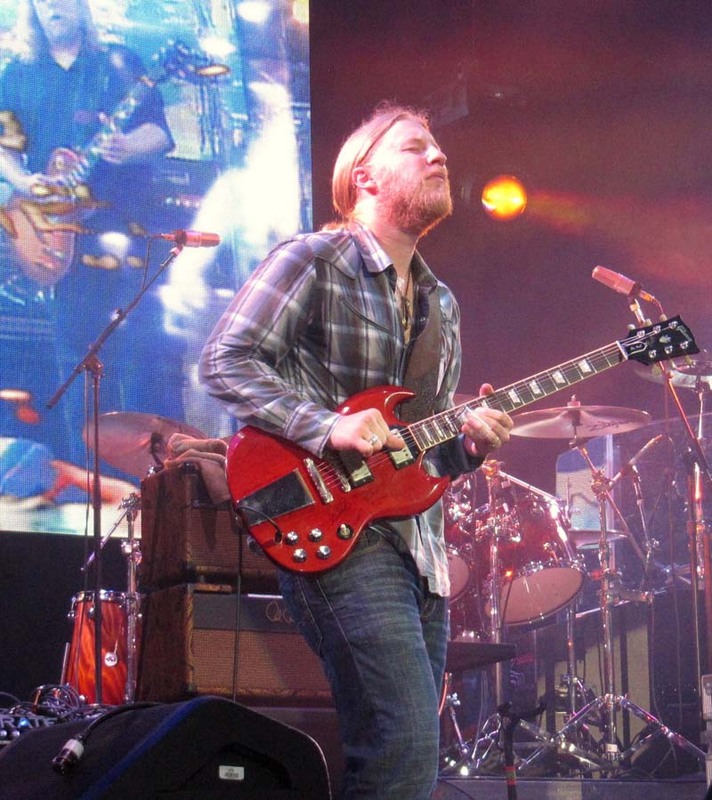 I have always wanted to see the Allman Brothers and here was my opportunity. 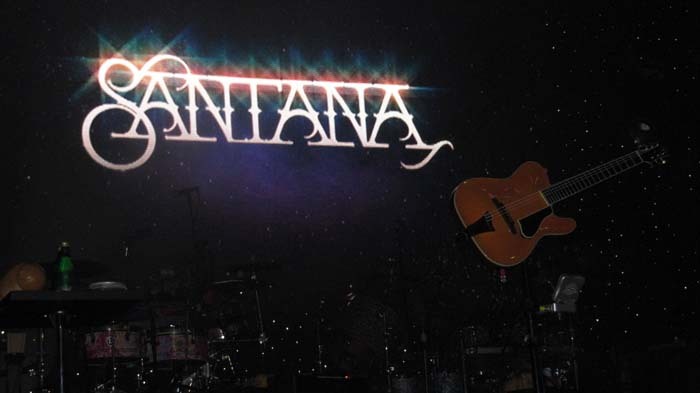 The fact that Santana was also on the bill was a huge bonus. The concert opened with music filling every molecule of airspace. It was loud and driving and continued well into the night. After decades of wanting to see the band I was finally hearing the songs live, not just on a CD. I was in heaven! 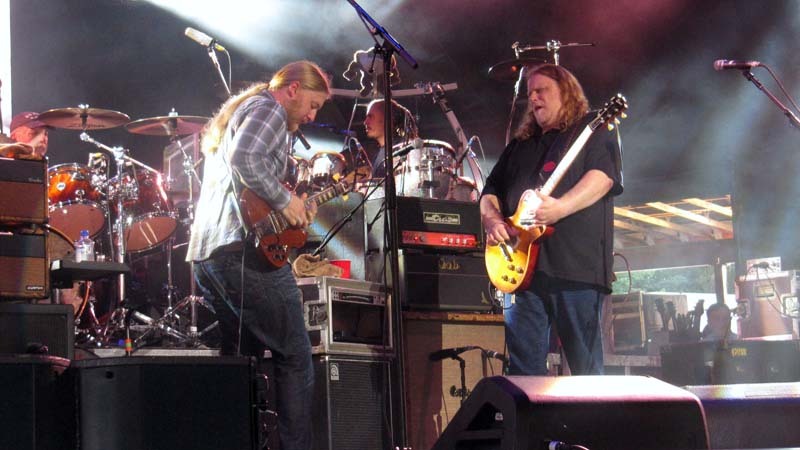 Here are two talented lead guitarists, Derek Trucks and Warren Haynes. Behind them are Butch Trucks (Derek's uncle) and Mark Quiñones. You can click on any picture to enlarge it. Derek was just listed in Rolling Stones' latest issue as being one of the best guitarists in the world. I couldn't agree more. To say that he's amazing is an understatement. 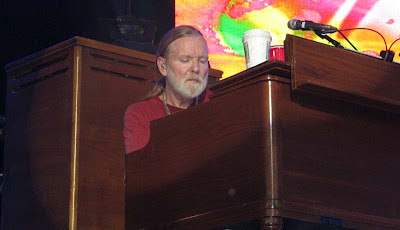 Gregg Allman has lived a life full of music, drugs, alcohol and medical problems (I've just finished his autobiography) and it shows in his face and in his mannerisms. He looks rather frail and distant but when he sings, the voice is still there, as is his organ playing. I was lucky enough to be sitting in the front row, close enough to check out his tattoos. At one point he was looking my way and I gave the peace sign and he waved back. 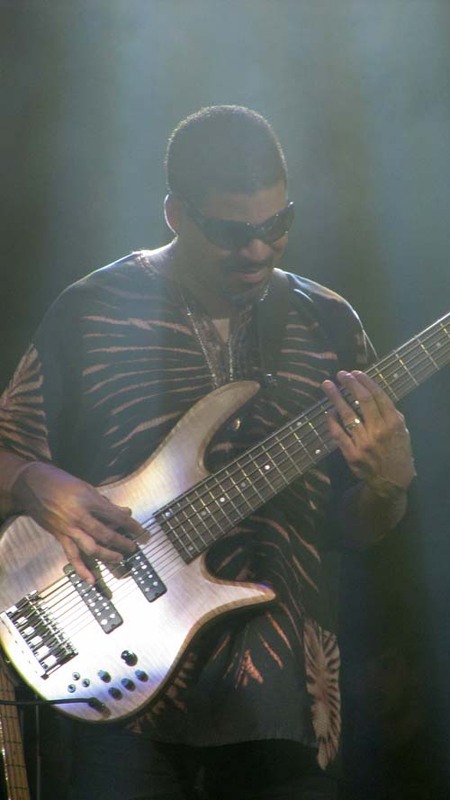 Playing bass is Oteil Burbridge. This picture was taken when the smoke was released onto the stage. 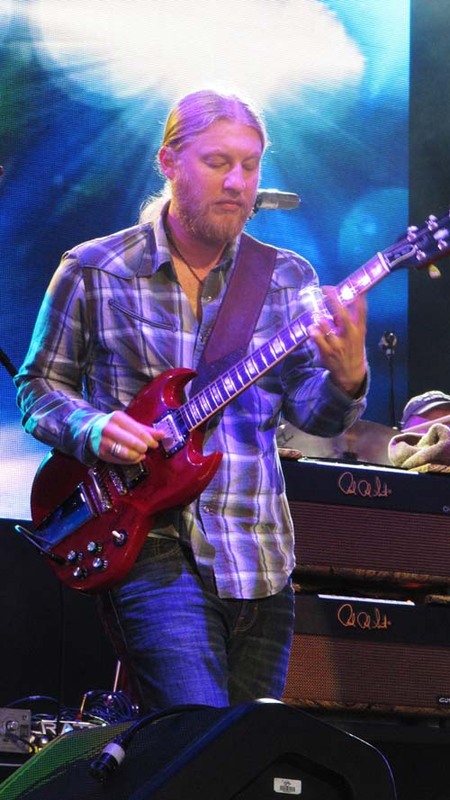 He complimented the others all through the show and shone, particularly, during the encore when he played the opening bass notes of Whipping Post. If you know the song I'm betting that you're humming those notes in your mind right now! Not only did I see the musicians when they were on stage but I saw them walking around off stage, to the side, as the instruments were being set up. It's a good thing as it was my only opportunity to see drummer Jaimoe Johanson﻿. 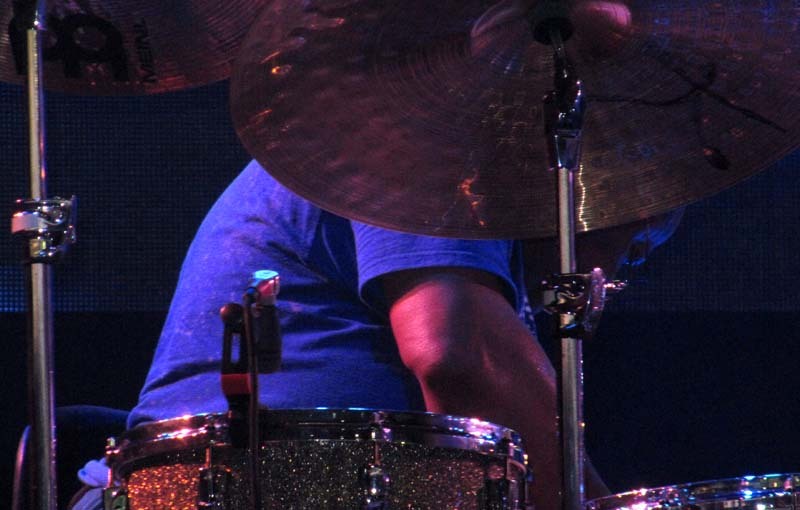 From my seat all I could see were his drums, and the cymbals blocked my view, other than his elbow. The concert was being professional recorded and CDs were being sold after the concert. Now I can be back there again and again. Seeing the Allman Brothers Band was an item on my bucket list. However, now that I have finally been to one of their concerts I want to go again and again. Hopefully I'll have the opportunity again one day. This was one of the best shows I've heard, and I've been to many.